Cranberry Facts and Fun – I used to think that cranberries grew in the water, since I always saw TV commercials and pictures of them floating and corralled by some kind of tubular floating device. 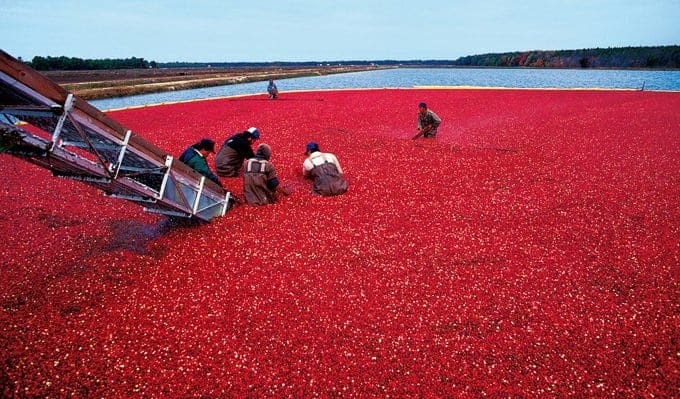 Have you ever been to a cranberry bog? On the sidelines were guys holding rakes, dressed in bibbed rubber overalls. One day I found out this isn’t how cranberries grow but how most of them are harvested. I learned the real deal, one beautiful September day, while boating in the Adirondacks with my dear friend Percy. She told me that she wanted to show me something. We pulled our rowboat up on some vacant, treeless sandy, little shelf of an island, and walked a few yards to an area of patchy, low lying green. Looking closer, to my delight, I saw cranberries among the shrubby vines. At 2 or 3 inches high at best, we started to pick them on our hands and knees. These wild cranberries were smaller and a lighter color then the store bought, but tasted exactly the same to me. That day we picked enough fruit to make a cranberry relish, and a compote. What a fun day and a great memory! Cranberries are one of the few fruits that are native to North America. Relatives to cranberries are the blueberry, huckleberry and lingonberry. 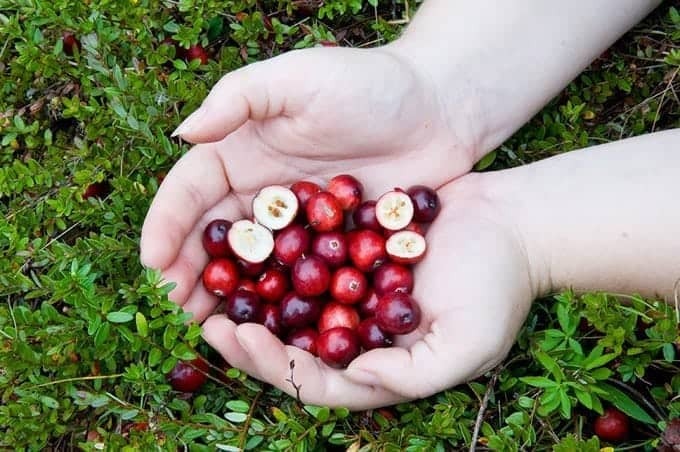 Native Americans were harvesting cranberries over 12,000 years ago. 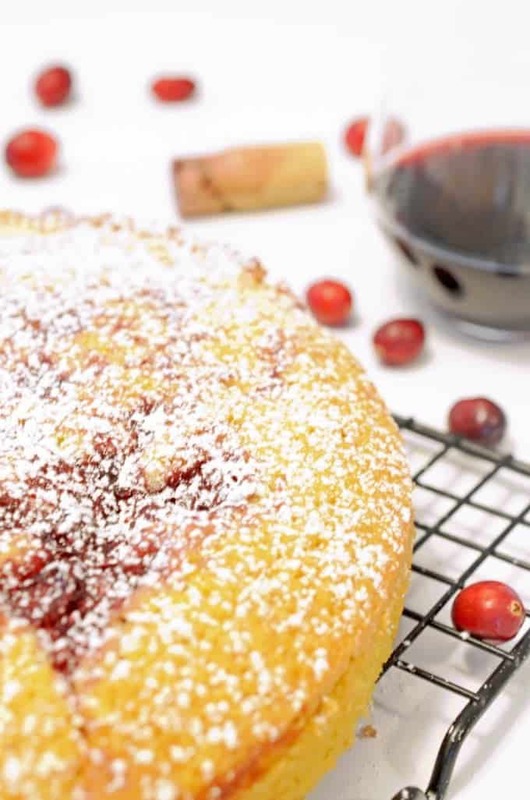 How do you like to use cranberries? We would love to hear. Cranberries were (and still are) used for food, medicines and and making dyes. They were named cranberries by early settlers, as a result of the appearance to their flower bud, which has backward twisted petals of light pink color, setting on the stem the flower resembles the bill, head and neck of a sandhill crane. They called them crane berries. Later the name was shortened to cranberries. 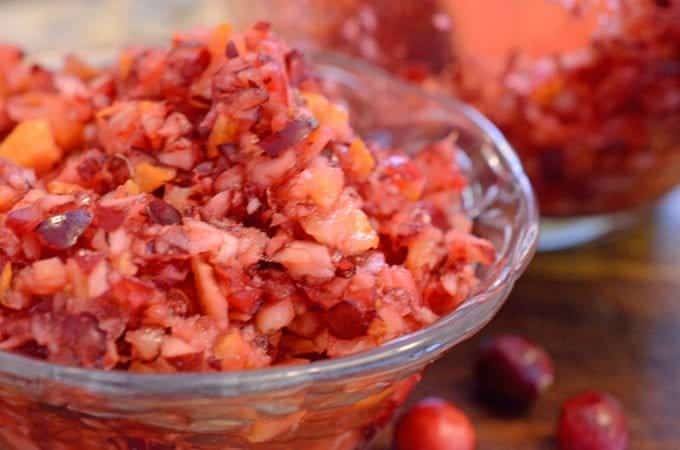 In the culinary sense, perhaps the most important use of the cranberry by the Native Americans was for pemmican, which was a type of preserved food. 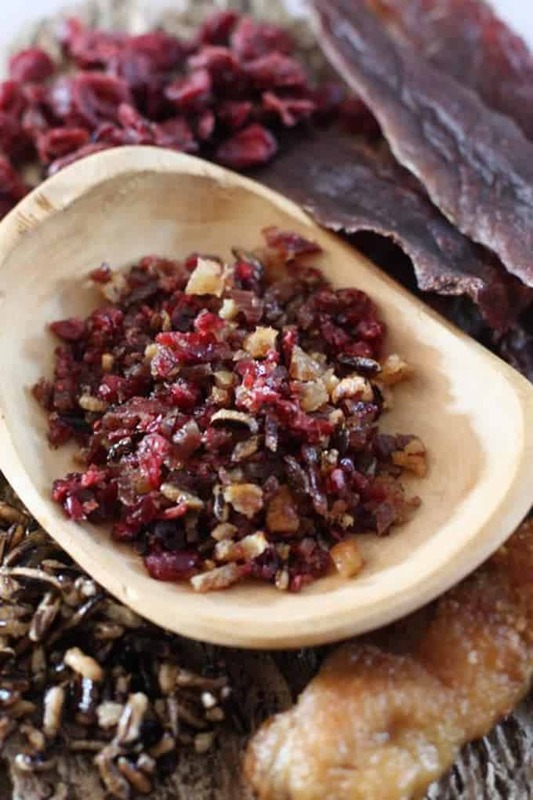 Pemmican was made from mashed cranberries, chopped dried venison and melted fat. The pemmican was stored in animal skin pouches and was edible for months. The acid in the cranberry and the added fat acted as preservatives. Pemmican provided protein, vitamin C, antioxidants and energy. Long journeys could be made with a cache of this food which could actually be considered in modern day terms, the preamble to the “power bars” that we use today. Medicinally, some of the uses of cranberries were as a poultice, made by crushing the berry to a pulp, for application to infections and wounds. 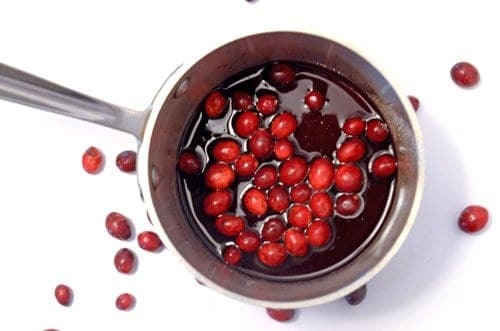 Cranberries were also considered a blood purifier, help for stomach cramps, a fever reducer, laxative and even used to help during the birthing process. 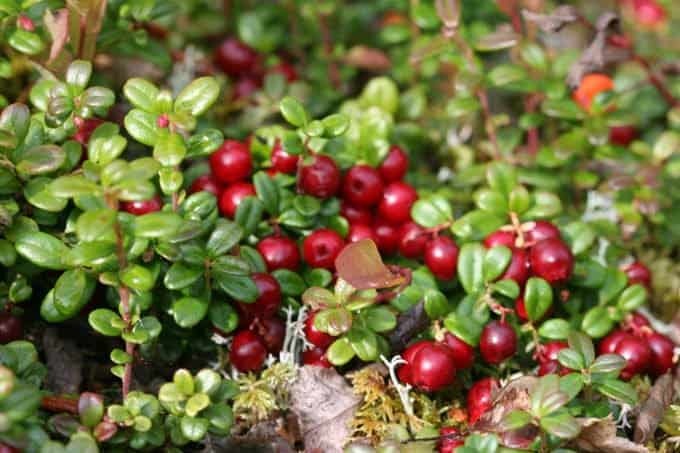 Cranberry leaves were used for tea, fresh berries eaten raw or dried and formed into patties and stored for use over winter months. Cranberries enhance weight loss. They emulcify fat deposits in your body and their fiber helps to promote satiety. They boost immunity. Cranberries are rich in anti-oxidants. Cranberries may help prevent cancer.They contain cancer-fighting agents such as proanthocyanidin and flavonoids. They help fight tooth decay. Cranberries help fight urinary tract infections. Cranberries were first commercially cultivated around 1816 on Cape Cod. Today, farmers grow cranberries in beds, located on bogs or marshes (they love the acidic soil available to them there) topped with well drained soil or sand. At harvest time these beds are flooded, after the berries have been mechanically raked. The cranberry has a 4 chamber air pocket inside, allowing them to float. This is a huge aid in gathering. Today we know that cranberries contain at least 5 highly titled phytonutrients that are noted for their antioxidant, anti-cancer and anti-inflammatory properties. Antioxidants work by aiding in prevention of harmful microorganisms (free radicals) attaching to our cells. This helps to prevent infection and disease. Cranberries are also considered, by many, to help fight types of influenza and even help lessen the symptoms of the common cold. The caveat is, it’s the whole berry (the body and the skin left after pressing) that really counts for providing the phytonutrients. The cranberry juice that we buy at the store, is usually loaded with sugar. As a matter of fact, sweetened cranberry juice can have more sugar per ounce then regular soft drinks! It’s what’s left after the pressing of the juice that contains the bulk of phytonutrients found in cranberries. A ripe cranberry will bounce. Hence, cranberries are sometimes called Bounceberries. This is how the packaged berries that we buy in the store are graded. They actually are lightly bounced on a belt with walls, a number of times in processing. Those that don’t make it over the wall by bouncing are mechanically eliminated from the acceptable cranberries that will be packaged as fresh. Today, cranberries are the official state fruit of both Wisconsin and Massachusetts. Wisconsin leads the US in the business of cranberry production by providing over 50% of the market. Massachusetts, New Jersey, Oregon and Washington follow, in that order. In production, cranberries are measured as “barrels”, which are 100 pounds of cranberries. It takes around 450 cranberries to make a pound. Believe it or not, only 5% cranberries produced in the US are sold as fresh. 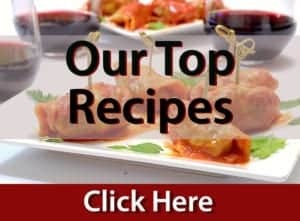 The rest are pressed for juices, juice blends, canned sauces and additions to other products. Cranberries go well with oranges, chocolate or white chocolate, honey, maple syrup, sweet squash and really only limited to what your taste buds allow. 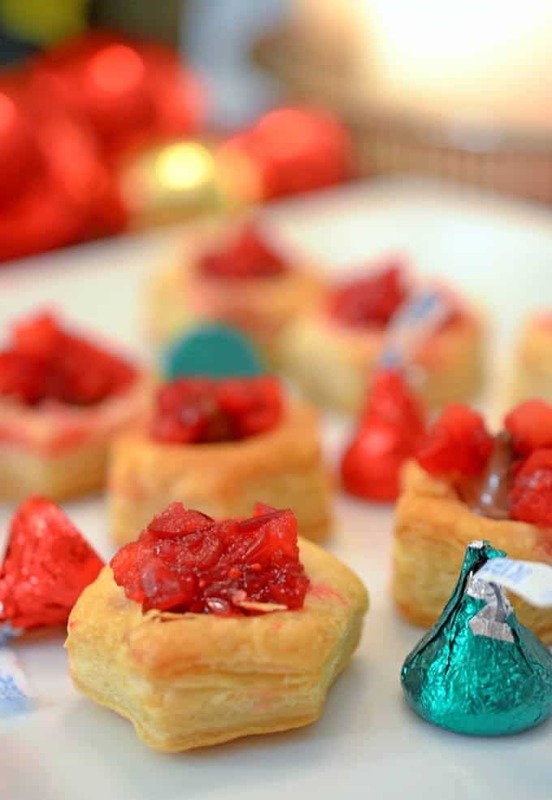 Anything sweet will help balance their astringency. I’m planning on drying some myself, in an oven, to store for munching. Maybe I’ll make some cranberry leather. I’d also like to make a compote using brandy, walnuts and maple syrup. 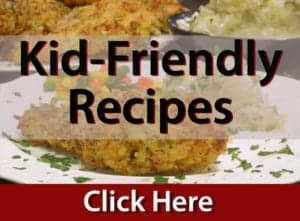 Cranberries added to pork or games is the bomb and even works for poultry as well. 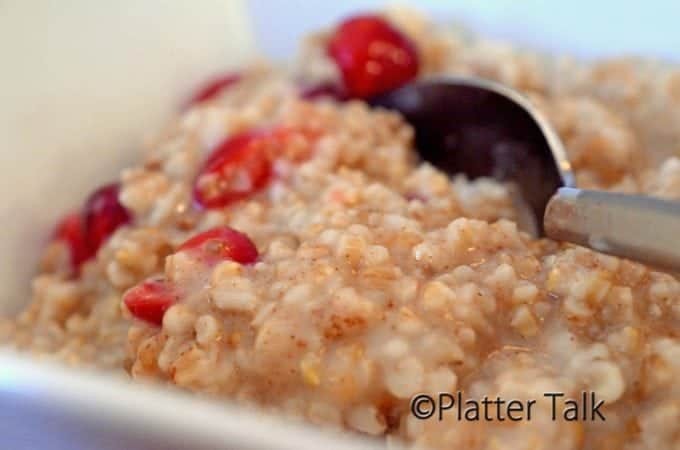 I love cranberries added to couscous and wild rice, or as a surprise of balance in a chocolate chip cookie, using white or semi sweet. Cranberries are great with chopped walnuts or pecans. They love cinnamon and five spice. Of course vodka, peach schnapps and pureed cranberries with a spritz of fresh lime is on the list too, sooner then later. I used to think cranberries grew in the water too haha. I was just a kid at that time though! 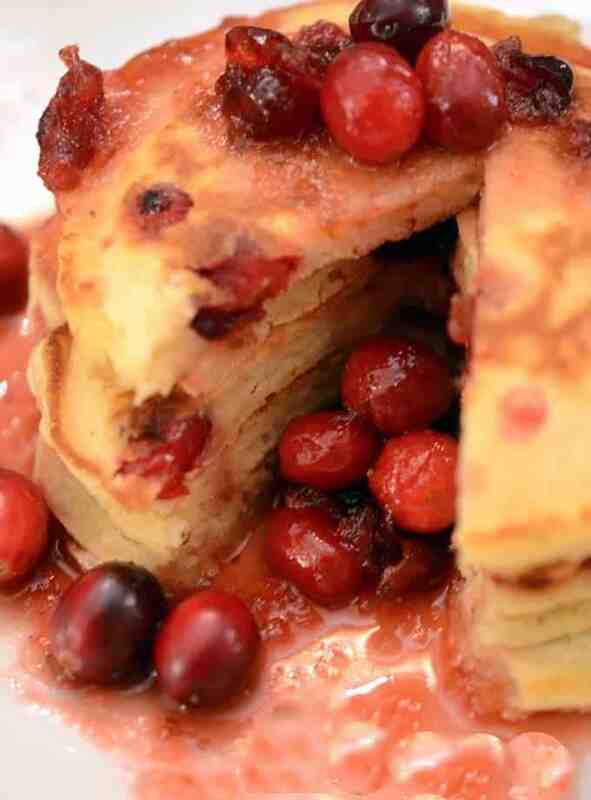 I’m loving the cranberry orange pancakes. They sound so yummy! I enjoyed reading about all the fun facts of cranberries. I had no idea the process they go thru to get to us at the store. Oh, I love bounce berries and we have it every week. Mostly the dried berries or frozen since we don’t get fresh ones here. I love them in granolas and my cookies. I love that — bounceberries!! I’ll have to check the cranberries from now on. Your facts and tips are wonderful. I’m going to make it a point to use cranberries throughout the year. They’re available in frozen form and we really like them.